Competing to be crowned kings of the Campeonato Federal del Asado 2017. 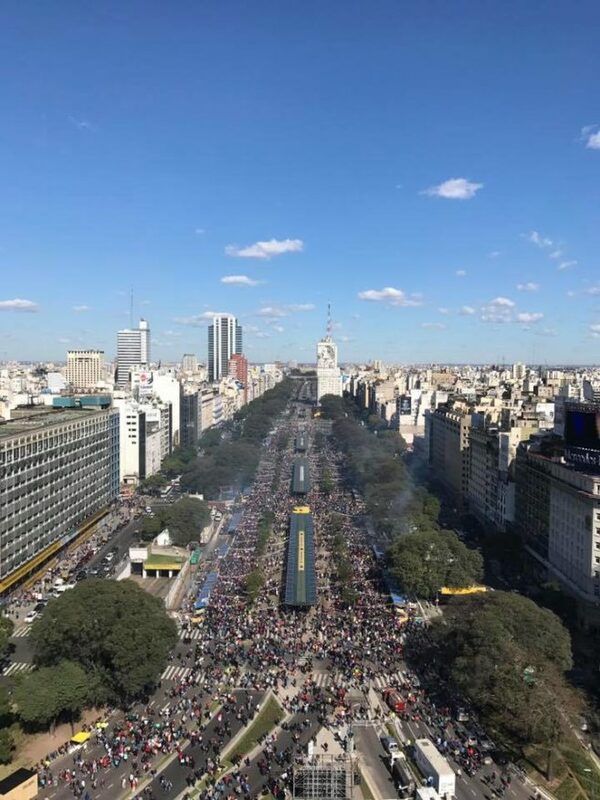 Under the shadow of the Obelisco in the centre of 9 de Julio – the widest avenue in the world – some serious meat appreciation was going down on Sunday afternoon. 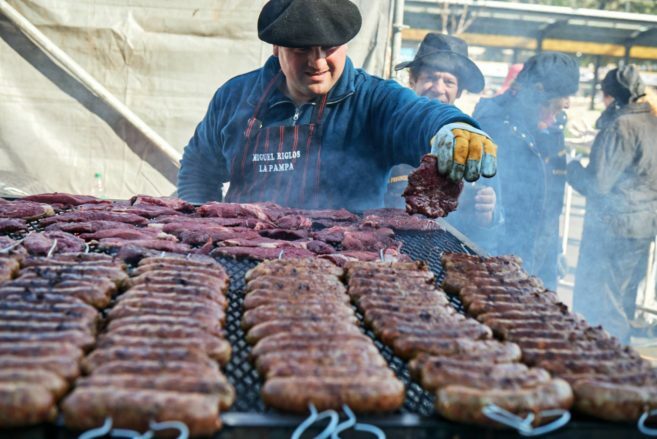 More than 350,000 people thronged the smokey, meat smelling streets as Argentina’s 23 provinces and hosts – Buenos Aires – represented at the second annual BBQ contest. Meat lovers packed out 9 de Julio Avenue for the event. 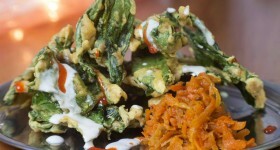 Photo courtesy of BACapitalGastronomica. If UNESCO existed in terms of food – I’m pretty sure most Argentine’s would happily slap a heritage sticker on their beloved asado (BBQ). It’s in their bones. “An asado is the answer to everything,” is the strapline of one of my Porteño (Buenos Aires resident) friends here. “It’s all about the ritual, from preparing the fire to sharing a delicious bottle of red wine with good conversation and laughs around the fire with friends and family,” says Rafa. It’s about time too. Slowing it down real nice and savouring some well spent moments. Panza llena corazón contento goes the phrase here (full belly, happy heart,) and nothing tops the menu like a good asado. It’s all your Christmases at once, except it comes more than once a year – for most it’s a weekend ritual. I mean these guys even give up a round of applause for the asador (person manning the BBQ) when their magic is done! On a scale this big, the asadores (BBQ chefs) work in pairs, the asador – hand in hand with their ayudante (helper). The eager contestants were selected through the Union of Tourism, Hotel and Gastronomy Workers of the Argentine Republic (Uthgra). 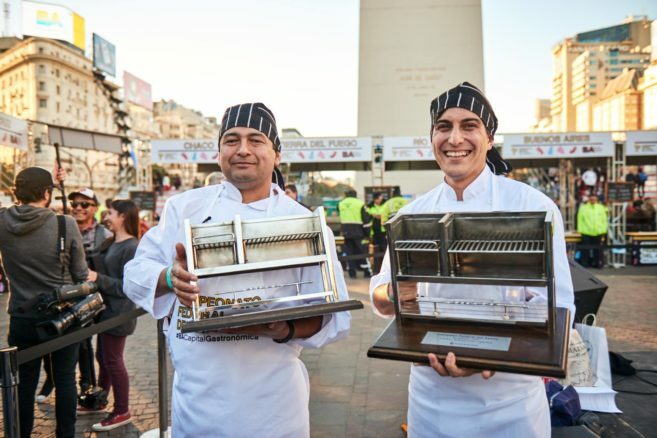 Master Chef style – parrillas (BBQ’s) and tables were neatly set-up side by side as each province showed-off their culinary talents in the “Estadio del Asador” (BBQ Stadium) where the parrillas’s sizzled on into the late afternoon. 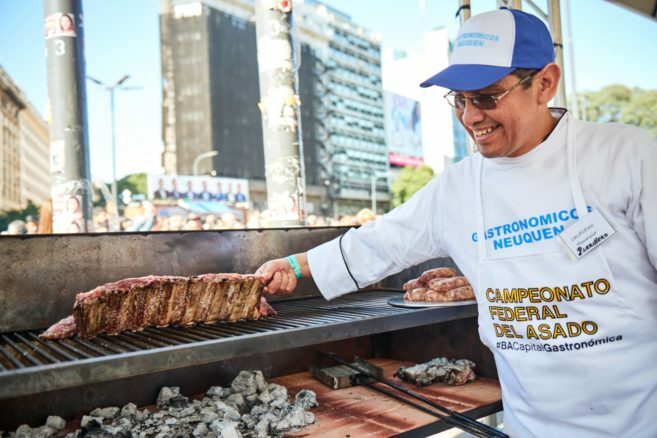 The 24 teams cooked up all the classic cuts of the blue and white BBQ; un corte de vacío, un asado de tira ancha, una colita de cuadril and chorizos. Inspecting the meaty goods for the perfect punto. 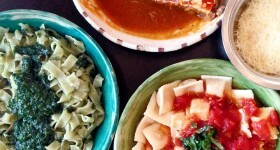 Photo courtesy of BACapitalGastronomica. 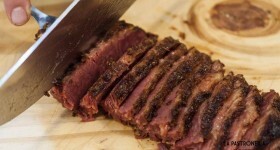 Delicious and often overlooked flank from around the belly of the cow. You don’t normally see this outside of Argentina, so take advantage of this best-cooked slowly strip which delivers on flavour and has an addictive crispy fat, smothering the exterior. So this is confusing. 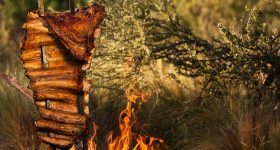 Asado is the name for BBQ in Argentina but it also refers to the large section of the rib cage that produces the finger-lickin’ tasty morsels of short or spare ribs. You want them a bit crispy on the outside to contrast with the tender meat inside. Pure salty goodness. Nothing puts a smile on a parillero’s face more than turning the asado. 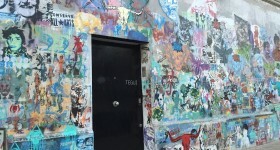 Photo courtesy of BACapitalGastronomica. 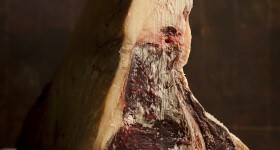 Used for everyday cooking in Argentina, the classic rump is nothing to write home about but is nevertheless a thick, meaty cut of reasonable quality. And you get a lot of it for your pesos. Moist, fatty, meaty. A good chori is a total pleasure. Shove it in a bread roll and it becomes the humble feast of kings known as the choripán from the chori-zo (sausage) and pan (bread). Pile on the typical local herby and spicy chimichurri sauce and you’re good to go. Using their own tools, chefs chose their fire of choice: charcoal, quebracho wood – a hard wood native to South America – or both. Finally the master parilleros had to pre-decide how they were going to cook each cut and chalk up their choices on mini blackboards before the judges got down to tasting the cuts. JUGOSO: Officially this means medium-rare in Argentina, but it tends to be more on the medium side for most parilleros (the grill chefs). A PUNTO: Medium, still a bit pink in the middle but not so juicy. COCIDO: Well done. Well dead. When the parrillero’s work is done, the judges tuck in – tasting and scoring at each stand. Made up of a technical panel representing some of the best porteña parrilla restaurants and other gastro institutions and critics including the renowned chef and presenter Francis Mallman – this year’s edition also threw in a couple of Buenos Aires’ neighbours who were chosen in a social network competition. Someone’s feeling confident – judging time with Francis Mallmann. 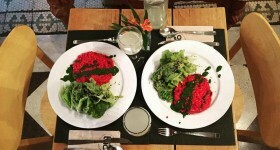 Photo courtesy of BACapitalGastronomica. Visibly exhausted but pent up with excited anticipation, the parrilleros and ayudantes stood around eagerly awaiting the drawn out winning announcement. The renowned wine region of Mendoza scooped the prize last year. After presenting medals to all 24 couples – the winning team was finally called out. 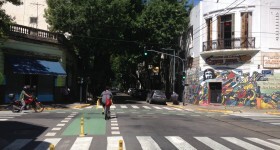 The provincia of Santa Fe, around 500km North West of Buenos Aires, had done it. All that work, heat and meat had paid off. Marcelo Herrera and his helper Javier Ramall stepped up to the stage. Their trophy? A mini silver parilla each of course! Santa Fe champions, Marcelo Herrera and his helper Javier Ramall celebrating. 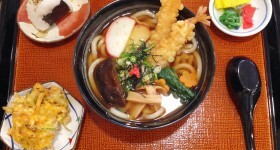 Photo courtesy of BACapitalGastronomica. “I’m really moved. This is huge for me. I think it’ll only hit me tomorrow that I won out of all the 23 provinces,” winner Marcelo Herrera told press. “I’d arrived with every faith in winning,” he added. It’s a profession, which has seen the Rey de la parrilla (King of the BBQ) travel from Chile to Italy with his gastronomic grilling skills which all started when he was 27 years old. “We are so proud of this festival,” said BA’s Head of Government Horacio Rodríguez Larreta as he presented the awards. 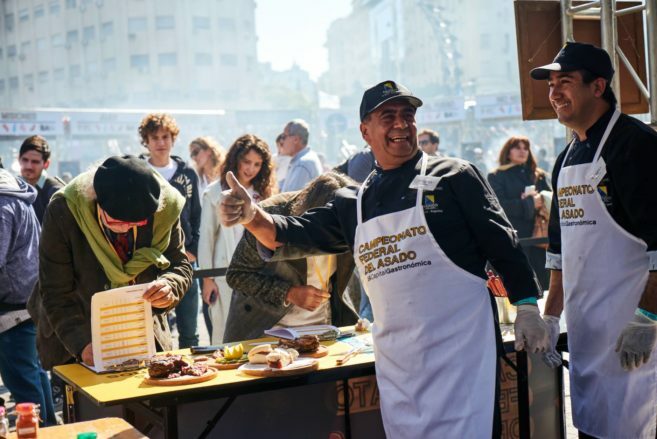 “The idea is to make it even bigger and better every year.” It’s all part of a plan in the making to head up Buenos Aires as the gastronomic capital of Latin America. 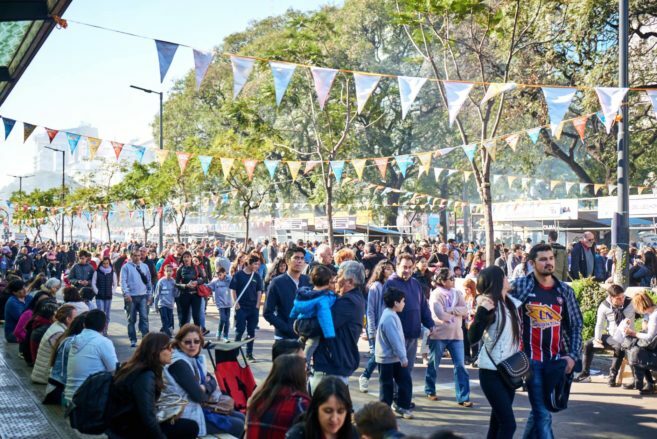 Newly given the green light in the city – gourmet food trucks and food fairs have quickly become a favoured food trend in the city and the Campeonato Federal del Asado 2017 didn’t disappoint in it’s selection. Meaty favourites such as the crocante choripan (crispy sausage sandwich) with chimichurri (the classic saucy concoction of herbs and spices; onion, garlic, coriander, parsley, oregano, thyme, chili, lemon, olive oil and vinegar) to steak sandwiches with rocket, mustard and caramelized onions. Even veggies were catered for in this meat haven with lentil burgers and veggie kebabs in basil pesto. 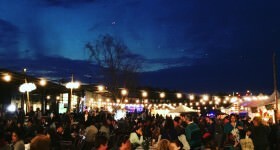 Crowd pleasing food trucks offered up traditional, trendy and international flavours. Photo courtesy of BACapitalGastronomica. And if you just wanted to say basta! (enough) to the choripan-mania then you’d be well catered for at the Patio de las Colectividades which offered up international taste bud ticklers such as Austrian, Jewish, Lebanese, Mexican, Colombian, French, Italian, Japanese and even Vietnamese cuisine. As the sun shone on the BBQ’d streets, live traditional folklore music and dances played out on the main performance stage to accompany the serious wall to wall chowing-down. People of all ages milled around celebrating this grand Argentine tradition which to be honest – takes some beating. 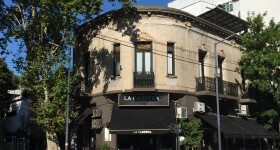 To find out more about Argentina’s meaty story and what to ask for at the steak house read my other blog A Meat Lover’s Guide to Beef Cuts in Argentina. 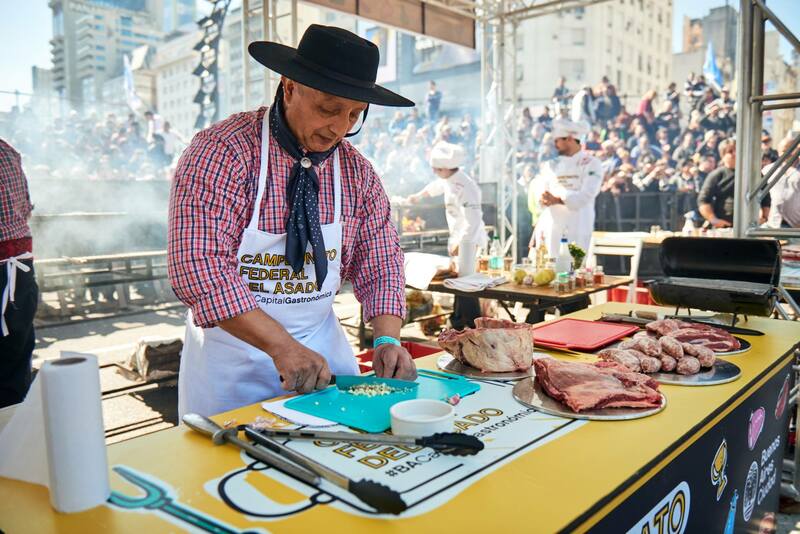 More information about the Campeonato Federal del Asado here and on Facebook.